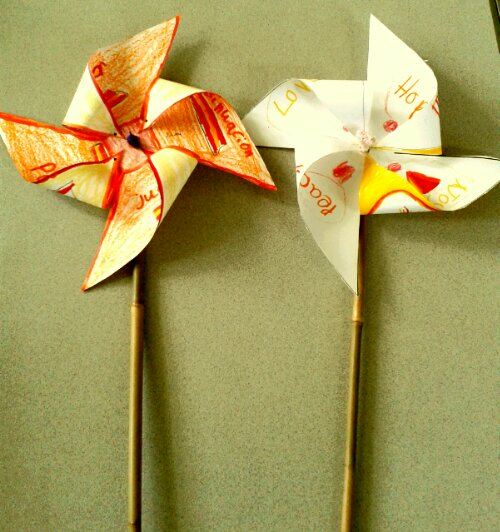 Following the assembly I did an RE lesson with Year 2, part of which was making some Pentecost pinwheels – incorporating the wind and fire of the Holy Spirit. I got the inspiration for this from this website here which I found via a search on Pinterest. This reminded me of how brilliant a resource Pinterest is for craft activities for children (and in particular Christian ones as I think a lot of home schooling takes place in the States where there is great enthusiasm for Pinterest). So in case you want to try the same, here is a downloadable template for making one of these windmills. It works best when printed onto thin white card. Another part of the lesson was thinking about the words LOVE, PEACE, HOPE and JOY and what they mean to us. I listed these words in the different languages represented in the school. Since it took me quite a while to find these words in these languages I share them here in case you want to use them. Those that are normally written in a non-latin script are written in phonetic English.